Based on the weather bulletin update posted by Philippine Atmospheric, Geophysical and Astronomical Services Administration (PAGASA), Typhoon Jose (International name: Halong) has slightly weakened while moving in a northwest direction. According to the Weather Bureau, Typhoon Jose will no longer affect any part of the country but the Habagat will continue to bring rains over Ilocos Region and Central Luzon while Metro Manila, CALABARZON and MIMAROPA will have occasional rains. Keep monitoring #walangpasok and follow us on Twitter @DepEd_PH for real-time updates on class suspension. 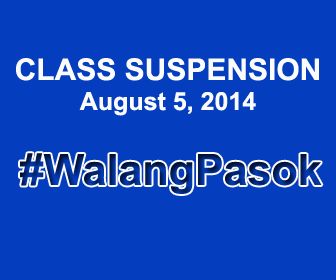 For the updated list of class suspensions on August 5, 2014, don't forget to bookmark and refresh this page from time to time. More updates will be posted in our Facebook page.